Another Airgun Shipping Container (Sea Can) Shooting video and for this indoor filed test I put the KWC - Cybergun M45A1 1911 CO2 Blowback Airsoft Pistol through its paces. Now back to the Field Test Shooting Review at hand... I started off by placing 5 shots through my Chrony Chronograph using a brand new CO2 with .20 gram Airsoft BB's and got a really consistent reading for all 5 shots with an average of 357. The lowest shot was 353 and the fastest shot was 364 so all shots where really close in velocity. The container temperature was a near perfect shooting temperature of 23 degrees Celsius which was ideal for optimal CO2 velocity testing. During my accuracy portion of this Field Shooting Test. I used my new seated in the back and sand bag rested up front shooting position which is about 30 feet back from my paper target. I did notice during my Chrony testing that the Cybergun KWC Colt 1911 Rail Gun M45 A1 CO2 Blowback BB Pistol liked to shoot a bit high, perhaps the hop-up needs a bit of twerking? So for my accuracy testing I shot at the bottom ring of the target, this helped me get more shots on the paper for sure but the Airsoft BB's still moved around a bit vertically. I was able to get about a 4-5 inch 10 shot grouping which is totally acceptable for a close range Airsoft sidearm and in an Airsoft battle I would think even shooting at about 50 feet or so I could easily hit a persons mid section consistently. 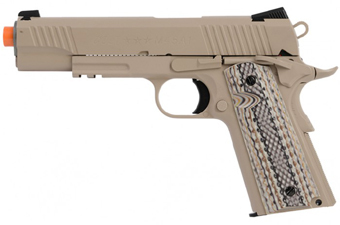 The Cybergun KWC Colt 1911 Rail Gun M45 A1 CO2 Blowback BB Pistol has a ton of blowback kick to it and a super nice single action trigger like all the KWC 1911's The modern Tactical coloration and trimmings makes this pistol a great choice as a present day side arm. It's real looker for sure with performance to match!